Optimizing your website for search engines helps to increase the visibility of your website on search engines that increases the ranking and moves your website on the top of the search result. Only the best and premium SEM and SEO keyword research tools can helps you to find the most profitable keywords for your website niche to optimize your website content according the the suggestion. Here I have created the list of best and premium SEM, SEO keyword research tools that helps to steal your competitors traffic and uncover their conversion strategy with displaying organic and paid search results along with top organic keywords along with their search trends and CPC and backlink details of your and competitors website. derived from all the search engines. You will get the following analytics report with this tool to find out your competitors strategies in display advertising, organic and paid search, and link building. Organic search results to find out your competitors best keywords to discover new organic traffic for your website. 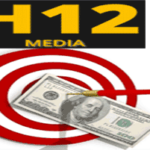 Paid search results to uncover your competitors online advertising strategies and budget. Backlinks information to conduct deep link analysis and to understand about the referring domains. Video advertising research to uncover your competitors video advertising strategies to create effective video advertising campaign. And keyword research result to find the right keywords for SEO and PPC campaigns. Majestic has the collection of premium tools for SEM, SEO and keyword research mostly useful for SEO professionals, media analysts, entrepreneurs and developers. It helps to find out how all the websites on the internet link to each other with the largest link intelligence database. It includes the following sets of link intelligence tools to explore your website domain, URL, keyword or phrase along with facility of comparing with other websites. 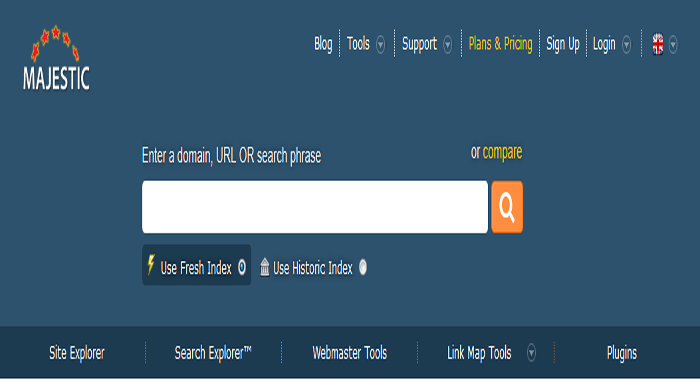 Site Explorer tool allows you to explore your domain or URL in great detail. Bulk Backlink checker tool allows you to count the number backlinks for many domains at a time. Compare Tool allows you to compare the status among up to 5 different domains. Search Explorer tool allows you to find the related keywords along with their detail statics. 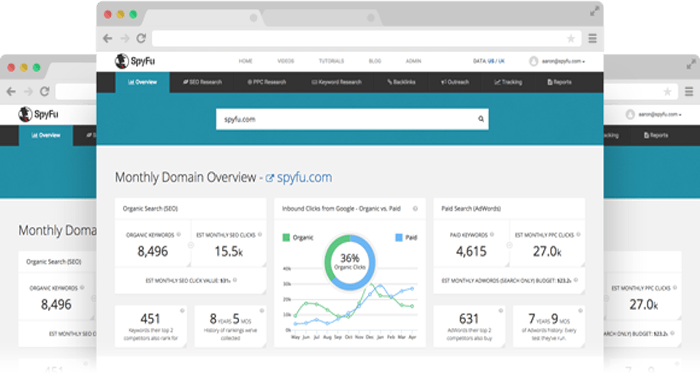 Spyfu provides powerful set of SEO and PPC research tools which allows you to download your competitors most profitable keywords ads for paid and organic search with exposing the search marketing secret formula of your most successful competitors. Its SEO research tool helps to improve your ranks with finding your competitors keyword strategies and getting your keywords ranking moving on the first page of the search result. With the PPC research tool provided by spyfu helps to discover the most profitable keywords the your are missing and also helps you to remove the bad keywords from your PPC campaigns. 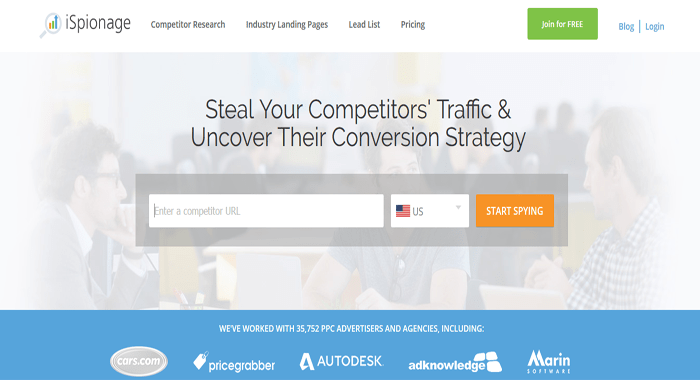 Ispionage is the best keyword research tool to steal your competitors traffic and uncover their conversion strategy with displaying organic and paid search results. This tool helps you to drive targeted traffic, generate more leads and increase the conversion rate with finding profitable keywords faster with competitors PPC keyword lists. Following are the advantages of using this tool for your keyword research work. 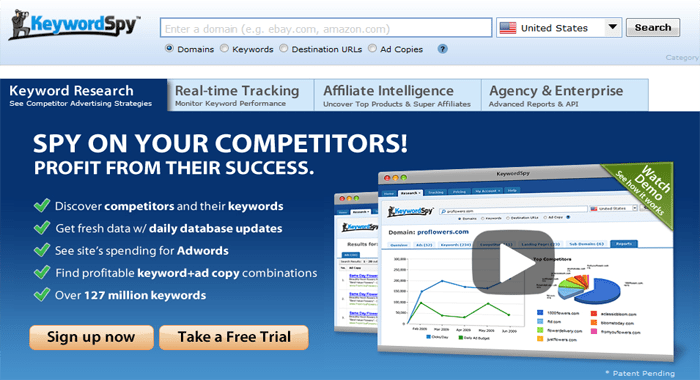 You can find and download the profitable keywords with competitors PPC and keyword list. You will find how much your competitors are spending per month on adwords. It also helps to find your competitors most profitable keywords with keyword effectiveness index. This tool not only finds the monthly traffic volume for any specific ads. It also helps to find out top competitors in major search engine. Keywordspy is the best keyword software and keyword tool for keyword research and tracking which helps you to perform advanced keyword research and keyword tracking to study what your competitors have been advertising in their adwords campaigns and other PPC campaigns. This tool also helps to get complete in-depth analysis, stats, budget, affiliates and ad copies of your competitors. Following are the benefits of using this tool for your keyword research and tracking work. 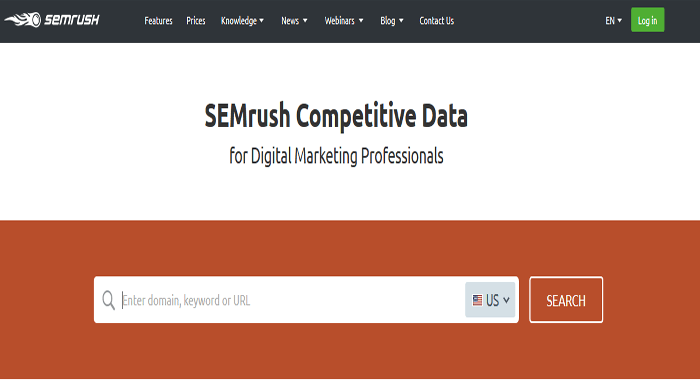 This tool allows you to discover competitors and their keywords with daily updated data. You will do real time tracking of your keywords in major search engines like Google, Bing and Yahoo. With using affiliate intelligence tool, you can instantly lunch a profitable affiliate campaign quickly and easily. 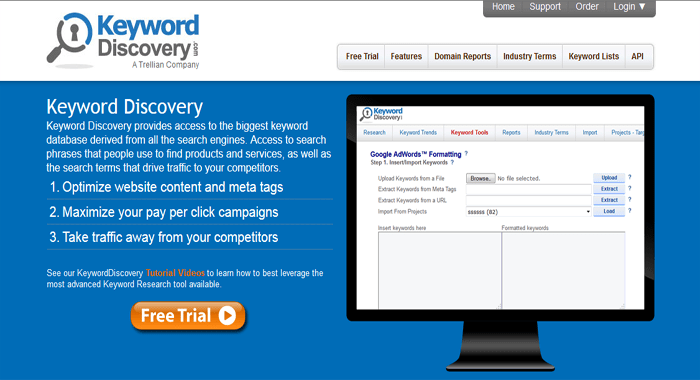 KeywordDiscovery tool is the advanced keyword research tool and search keyword suggestion tool in order to find more relevant keywords from your target keywords. This tool will helps you to optimize your websites content and meta tags to maximize your pay per click campaigns and take traffic from your competitors to your website. Following are the advantages of using this tool for your keyword research and suggestion. With keyword research tool, you will find more related and relevant keywords as other keyword research tool works. Based on Trellian Competitive Intelligence you will find the top traffic sites per keyword. The search results can be organized and saved into projects which can be easily translated and exported. 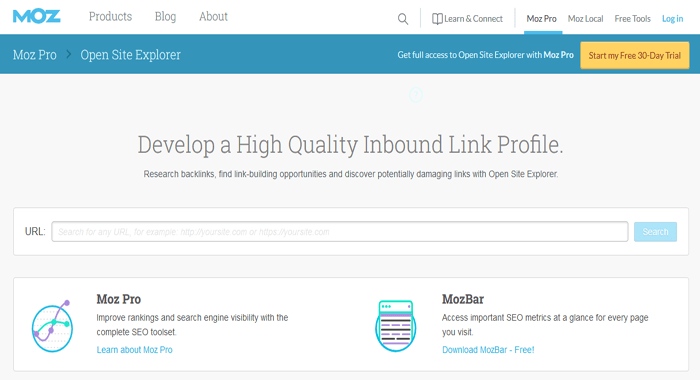 Moz open site explorer is another best tool to uncover content and link building opportunities, track your site’s link profile over time and compare to competitors for intelligent, targeted link building. It helps to find out about inbound links along with link title and URL, link anchor text, spam score, page authority and domain authority. You will also find the linking domains and top pages of your website along with compare link metrics compared to another URL. You will also access the link opportunities in order to help to increase the effectiveness of your inbound marketing efforts. 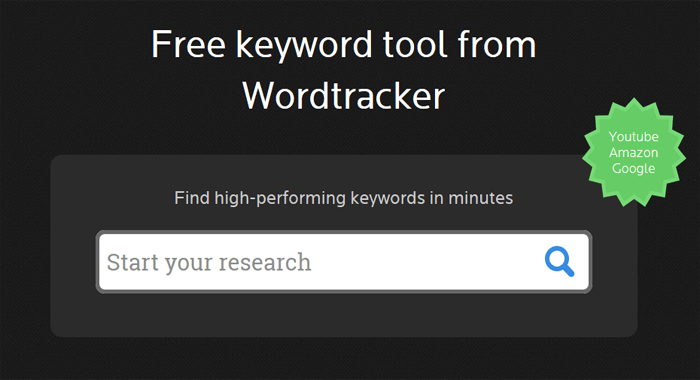 Wordtracker is the best tool for reveling high performing related keywords for your website. This tool helps to grow your website traffic with getting keywords what the people are searching for your website. You will optimize your website according to these keywords for boosting your search engine ranking. This tool provides profitable keywords list which are based on real search on the major search engine by real people. Following are the benefits of using this tool for your high performing keyword research work. You can simplify your SEO tasks with providing enhanced tools to make your keyword research faster, easier, and more effective. It also provides long tail keywords for high value keywords along with most popular keywords. You will identify and target profitable niche markets with finding what people are looking for online. You can find out keywords with a high search volume and a low level of competition based on two metrics competition and KEI(Keyword Effectiveness Index). 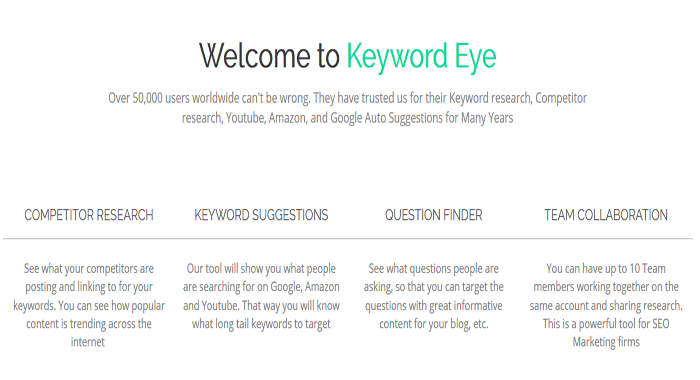 Keywordeye provides the set of tools which are best for digital marketing forms and individuals to grow their websites with providing data to help you design your marketing and SEO campaigns for explosive growth. Following are the features provided by this tool for your keyword research and competitor research work. You can search as many as you want along with searching from specific country database. You can do competitor analysis and link analysis along with including Google CPC data. It also helps get suggestions on what words you need to include along with your keywords. 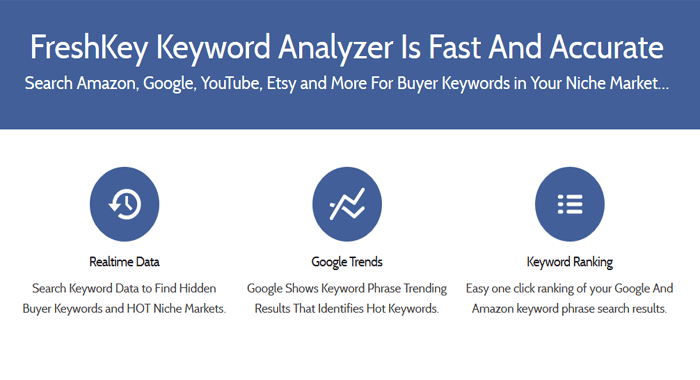 Freshkey is another tool for buyer keyword research work which searches on Amazon, Google, Youtube, Esty and more. This tool provides real time data on search keyword data to find hidden buyer keywords for your niche with identifying hot keywords from Google trends data. You will find keyword ranking status from Google and Amazon keyword phrase search results.